Convinced that only he knows the right path, President Trump made clear this week that he will move to expand tariffs on $200 billion worth of Chinese goods, and then stood back to await applause. This would be tariffs beyond those already imposed on $50 billion worth of Chinese products earlier this year, and it drew an immediate response from the Chinese for reciprocal tariff payments on $60 billion of U.S. exports. The move will mean higher prices for U.S. consumers on about 1,000 products, largely industrial goods rather than consumer goods. The products include electronics, food, tools and housewares, but not cell phones or Apple watches. There is no evidence yet that it will result in American-Chinese equality in trade of goods or a boost in U.S. manufacture, as the president seeks. Today’s homily is about haughtiness in the Oval Office, a case of acting as a leader against expert advice and at the expense of the American public. Trump said the United States cannot tolerate the trade gap between what it exports to China and what it imports from that country. “We can’t do that anymore,” he said. American businesses have said they are being forced to raise prices, forgo jobs and move some manufacture to China. The president believes that tariffs, which are border taxes, are a good, solid way to increase American manufacturing. 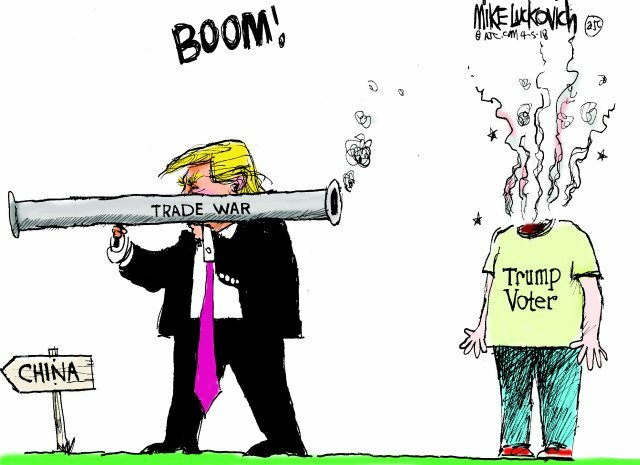 Economics studies by people not named Trump say not only will there be higher consumer and assembly prices, but job losses and retrenchment among many industries who depend on supply lines that are interrupted by tariffs. In any case, the decision will significantly escalate the trade disputes between the United States and China, which so far is refusing to renew trade talks with the Americans. There had been plans to restart talks in Washington later this month. As usual, congressional Republicans were silent, despite a general support among traditional Republicans for free trade arrangements. Let’s remember that this is the same China whose help we need to deal with North Korea, the same China that holds so much U.S. debt, the same China whose investments we keep running into in Africa and other parts of the world. This is the same China who is making claim to becoming the world next reigning superpower. In accompanying tweets, Trump, the guy who wants tax cuts rather than new taxes, promoted the idea of taxing imports, warning that countries that do not agree to his trade demands will be “tariffed,” escalating tensions as crucial negotiations loom with China and Canada. Farmers, truckers, labor unions and car companies all have responded negatively to the imposition of tariffs. In general, American businesses have said they are being forced to raise prices, forgo jobs and move some manufacture to China. The new tariffs will affect about half of all Chinese goods imported into the United States by about 10% at the start next week, and increase to 25% by the end of the year. Trump has threatened to tax all Chinese goods unless China changes trade practices, including pressuring U.S. manufacturers to share technical knowledge, and the overall amount of trade to be equal. There is a yearly deficit in goods trading of about $360 billion with China. Already there are tariffs on steel and aluminum imports from other countries, including Canada, Mexico and the European Union. The president tweeted that his steel tariffs have given “new life” to the domestic steel industry, and that price increases from those and other tariffs have barely been felt in the American economy. The New York Times said that neither claim is supported by economic data. Steel prices are up more than 10% since February, the month before Trump announced his long-awaited tariffs of 25% on steel and 10% on aluminum, from a wide swath of trading partners. Prices on washing machines jumped 20% in the months following Trump’s decision to impose tariffs on imported washers. In that time, employment in steel and aluminum manufacturing has increased by less than 1,000 jobs, according to the Labor Department. Two car companies have agreed to open manufacturing plants in China. Still, Mr. Trump said tariffs had put the United States “in a strong bargaining position,” alluding to upcoming talks with Canada in an attempt to complete a renegotiation of the North American Free Trade Agreement, and to a scheduled-but-tenuous round of talks with China next week. The limited effect of tariffs on prices on consumer products to date could grow noticeably larger if Trump follows through with more Chinese tariffs, and particularly if he makes good on his threat earlier this month to subject nearly all Chinese imports to tariffs. Maybe more hard-core Trump supporters should recognize that it is taxpayers who are paying for the America First agenda. It is a program that may sound good at political rallies and serve slogans, but it is difficult to see the positive effects.